Bringing in Jerry West as an adviser, as well as minority owner, to the Golden State Warriors was a very smart decision. The legendary executive has helped remake the team in a short amount of time. Golden State started the purge last year when they traded volume scorer Monta Ellis to the Milwaukee Bucks in return for oft-injured center Andrew Bogut and Stephen Jackson. Bogut is a legit 15-point and 10-rebound player, but he has averaged just 58 games in his seven-year career. It’s a good thing they have Andris Biedrins available to come off the bench. But if Bogut can remain healthy, he is a solid upgrade over Biedrins at the center position. He is a better rebounder and defender. Plus, he can score more effectively in the low post. Biedrins has battled injuries the last three seasons and never come close to the potential he flashed in 2008-09 when he averaged 11.9 points and 11.2 rebounds. In my opinion, Harrison Barnes was the most NBA-ready player in the draft. I was shocked the Cleveland Cavaliers passed on him and took Dion Waiters. Barnes is a solid player that should start for the Warriors from Day 1. 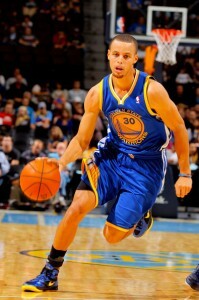 He will give point guard Stephen Curry a player to dish the ball to on the wing. David Lee is an efficient power forward and should help Bogut’s transition a little smoother. Klay Thompson is a young 3-point shooter who should benefit from Bogut’s presence. Expect an even bigger year out of him with a better center getting him even better looks at the basket. The Warriors upgraded the bench big time. One of the smarter decisions was adding veteran point guard Jarrett Jack. Curry is constantly battling injuries and Jack gives them insurance in case Curry keeps that history going. Jack played pretty well in a bad situation last year with the New Orleans Hornets. He averaged 15.6 points and 6.3 assists. They also added Carl Landry, an undersized frontcourt player who should help the bench. His energy, rebounding and second-chance points are a nice addition to any team. Brandon Rush gives them a nice backup to Thompson, and he could see some time at small forward as well if Richard Jefferson continues to decline. Jeremy Tyler may be running out of time to show he can play with the big boys, but he’s going to be buried on the depth chart this season. He’ll need injuries to occur for him to see much playing time. West has helped turn around a moribund franchise. He is hoping to help the team make a playoff appearance, something that has happened just twice since 1994. The only question is can they stay healthy enough to compete in a vastly improved Pacific Division?